One Momma Saving Money: Baseball Graphic Tees - Now $15.99 + Free Shipping (was $29.99)! 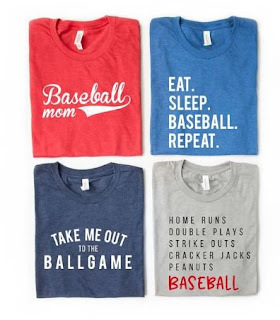 Baseball Graphic Tees - Now $15.99 + Free Shipping (was $29.99)! These Baseball Tees are a home run. Home plate, sunshine, and nine innings are all you need on a Summer day to make you happy. SIZES: *These are Bella Canvas unisex tees. We recommend ordering your regular t-shirt size.